BANGI, 9 Dec 2013 – The laws of science depict that all that happens in time, space and the cosmos are due to the “Laws of Nature”. Western scientists have done many experiments on nature focusing more on the empirical when there many more things that they have not been able to explain or answer, using only science. 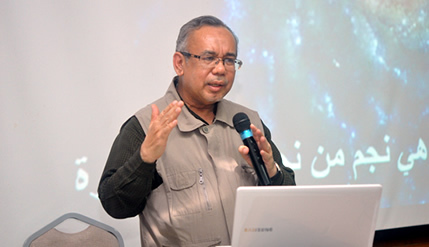 Dr Mat Rofa Ismail of University Putra Malaysia (UPM) in a talk organised by the Research Group of the School of Chemical and Food Technology (PPSKTM) of the Faculty of Science and Technology (FST) explained how science and nature can be explained and answered by the Quran. He alluded to the discovery of a new bright part of the universe in space recently and how it moves in an anti-clockwise swirl of a circle. The scientists explained the heart of the circle as a black-hole. Dr Mat Rofa said the movement in space is exactly the same anti-clockwise movement of the pilgrims when circumambulating the Kaabah in Mecca. The Ka’abah in the centre of the Mosque is black in colour, exactly like the “black-hole” in space. Thus the movements of the pilgrims moving around the Ka’abah mirrors the movements in space. Describing the Western scientists lack of faith and religion made them only half good in whatever they are doing, Dr Mat Rofa said the Western scientists can only answer a small part of the question of ‘how things happen in nature’ which can never truly describe and answer ‘why do these natural things happen’. Whereas a Muslim scientist would know that everything that occurs in Nature happens because The Creator wishes it to happen that way. Dr Mat Rofa explains that the harmony of natural law is the symbol of environmental compliance for the Divine Direction. Muslim scientists never separate between science and faith, between knowledge and religion. He added that both empirical knowledge and faith knowledge are studied in the same mould, integrated and intertwined not separated, unlike the Western scientists. The great Islamic civilizations were built on these very principles, he said. “We can learn many more things about our Earth and our Nature by simply reading, analysing and applying the words and wisdom of the Quran. “As scientists, we are tasked to find new ways to cure, new technologies, new meanings from nature and everyday life, but as Muslim scientists, we must never forget that upon the backbone of Nature, resides Allah’s will and his will makes it so,” Dr Mat Rofa said. He added that in Natures’ course everything that lives must die. That includes the stars, the planets, creatures and humans. Earth itself has an expiry date; the West calls it the end of the world, Muslims call it “Kiamat”, the judgement day. He said before that time comes, Muslim scientists must keep on learning from Nature and find the secrets of science found within the Quran. Muslim scientists must also keep their faith close to them while searching for scientific truth because they must weigh what they find on both empirical and faith knowledge. “In the end we are all just students sitting for an exam. From various age groups and backgrounds we are put to the test upon this earth and come judgement day, we are all given grades as to how well we did in this life. Our exam hall is Earth and our study text is the Quran. “So study and answer well. For all the questions in this exam have been leaked. We all know what is asked of us but somehow, as humans, we still like to cheat in exams,” Dr Mat Rofa said delivering his analogy of how nature works.